Varied and wide landscape of this country offers a variety of adventure hot spots including locations for Jeep Safari. If we want to categorize all the hot spots of Jeep Safari, we can divide them into three types. These include - wildlife sanctuaries, deserts of Rajasthan and the Himalayas. Corbett National Park, Bandavgarh National Park and Gir Wildlife Sanctuary are the most popular wildlife sanctuaries to go for Jeep Safaris. These full day safaris are arranged by the authorities where visitors have an opportunity to explore the interiors of the park and witness the wildlife closely. Some other wildlife sanctuaries of India are Betla and Palamu in Bihar, Periyar in Kerala, Dudhwa in Uttar Pradesh, Bandipur, Nagarhole in Karnataka, Srisailam in Andhra Pradesh and Rajaji in Uttaranchal. The deserts of Rajasthan are included among the preferred destinations for Jeep Safari. Main regions covered here include Jaisalmer, Bikaner, Jodhpur and Shekhawati regions. Some Jeep safaris here also include the popular wildlife sanctuaries of Rajasthan in their itinerary. Although the main focus is on the desert, the monuments falling in the route also can be covered. You can halt in the villages located in the desert region, enabling all the tourists to acquaint with the lifestyle of desert people. Most of the jeep safaris in the deserts are organized for the duration of one-two week. Jeep Safaris in India are conducted in the mountainous regions of the states of Jammu & Kashmir, Himachal Pradesh, Uttaranchal and Sikkim. It should be mentioned that the mountainous regions of these states have some of the highest motorable roads in the world. One major route of Jeep Safari in India includes Manali to Leh, Nubra Valley, Lahaul & Spiti, Ladakh and Garhwal Himalayas. 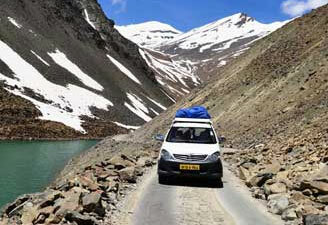 This route from Manali to Leh is the second highest motorable road in the world. It passes through Khardungla Pass in the state of Kashmir. Duration of these safaris is generally the longest, which may stretch up to a month also. If you want to exploring the off-beaten paths of Himalayas, or taste the risk of inaccessibility and thrill of driving through the cold deserts and valley areas of the Himalayas. Usually people have a misconception that Himalayan region is suitable only for those who like to trek or climb the snow-capped mountains of the Himalayas. But there is a very unique thrill in Jeep Safari, especially for those who want to travel through the lesser known, not the well-known, destinations. Jeep Safari also gives a humane touch to the adventure, as you get to explore the places, which may be even unknown to the locals. The state of Uttaranchal is divided into two regions - Kumaon & Garhwal. Both of these regions fascinate all the tourists. The best way to reach the exotic locales of the state is a jeep safari. You won't like to get into any other adventurous mold here. 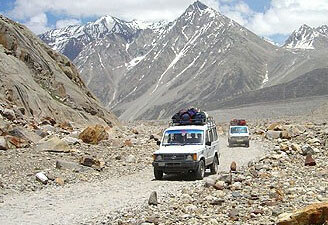 Jeep safaris in Himalayan range are particularly very popular among the adventure sport lovers. As Tibet is located on a high altitude plateau area, it's very difficult to access it easily. You may have to to travel on certain un-mettled stretches also. 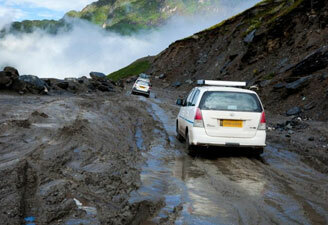 So, the best way to travel in these remote areas is to travel through a strong vehicle like Jeep. That's why Jeep Safaris here offer a good opportunity for you to visit the monasteries and lakes located in the high reaches of Tibetan Himalayas.